>FAILING the Inner Artist Test! >Back in 2002, Julia Cameron published a book called The Artist’s Way. I got the book, and worked through the exercises she suggested, including the concept of “morning pages” and making an “artist date” with myself each week for a while—attending art openings, visiting museums, or just letting myself sit by the Mississippi River with a sketch pad or journal and watch the sunset. I think Cameron’s book was instrumental in kick-starting my writing. 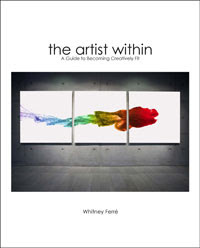 So when someone recently sent me a copy of The Artist Within by Whitney Ferre I wondered if she would bring something new to the pursuit of creativity. Ferre lives in Nashville, where she leads corporate seminars, teaches art classes, and serves as a creativity expert on television & radio. Whitney is also an artist, a wife, a mother, and a co-owner of Rumours Wine Bars that build communities around food, wine, and art. So, last night I opened up my new copy of The Artist Within and worked my way through the first few sections of the book. I say “worked” because, like The Artist’s Way Workbook, Ferre’s book has exercises to do to awaken one’s awareness of the power of the right brain to change every area of a person’s life. Ferre uses the eight principles of design to teach us “how we visually analyze everything we see.” I took her simple test to discover my strengths and weaknesses, and some of the results were quite surprising. You see, I consider myself to be in touch with my creative side, and I’ve always thought my “artist within” fed the other areas of my life. So, when I scored only 129 out of a possible 200 points in the eight areas of design, bells went off in my head. Under 125, “Don’t feel bad…. You are on the brink of something really fabulous.” Which sounded kinda’ cheesy, but I played along and went to the next section, which was about the design principle that I scored lowest in, Rhythm. Spiral: Go with the flow. So I looked at those definitions and thought, hmmmm, interesting that my favorite, the triangle, is about being goal-oriented, which is certainly my strength. And the spiral, my 2nd favorite, is about being flexible, which I’m not, but want to be. My 3rd choice, the plus sign, also indicates something I long for, better relationships. And the 4th and 5th were in the right order, in that my weaknesses are what they represent, grounding (square) and unity (circle.) Just as I was pondering the results, Ferre says to go to page 50 to learn the significance of the order in which I listed my favorite to least favorite shapes. I couldn’t turn the pages fast enough! Whichever symbol you listed first, your favorite, symbolizes your goal right now. Your second favorite symbolizes your hidden strength. Your third favorite symbolizes what you want your goal to be. Your fourth favorite symbolizes what you are considering ignoring. Your least favorite symbolizes what you are unconsciously ignoring. And this is just the first fourth of the book. Not sure if I’ll stick with it or not… but I am little intrigued. Maybe it’s just another rabbit trail on my search for balance. If I discover something amazing in future pages, I’ll get back to you! But I’d like to “round out” this post with a brief review of another book, The Middle Place by Kelly Corrigan. I was fascinated by the title when a friend sent me a link to Corrigan’s memoir, and this link to video of her reading her essay, “Transcending” because a few years ago I spoke at a women’s retreat in Austin, Texas and chose as my topic, “The Middle Way.” My talks at that retreat were about finding balance in our lives as women who are spiritual beings, friends, wives, and mothers. Kelly’s blog post was in O Magazine last month. So I got a copy of the book and jumped in, just a few days ago. I’m loving it so far. And it’s helpful to read other memoirists’ styles. 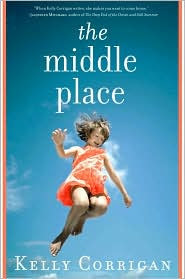 Kelly uses “the middle place” to mean the place women often find ourselves between childhood and motherhood. Especially when we’re struggling to raise our own kids, take care of ourselves, and often take care of our parents at the same time. Her battle with cancer, and her relationship with her father in particular, highlight her book. Love, Loss and What I Wore by Ilene Beckerman. Well, it seems that there’s a new play out based on the book! I’d love to see it, as I can’t help but invision my own memoir adapted for the stage or screen some day. But Beckerman’s book is a lighter look at the clothes she wore throughout the different stages and events of her life, and I’m not sure my story would adapt well for theater. For now those thoughts are only a distraction, when I need to get back to the goal at hand—drafting the rest of the book. Because I like triangles, remember?